Listen to the podcast. Find it on iTunes/iPod. Read a full transcript or download a copy. Learn more. Sponsor: HP. 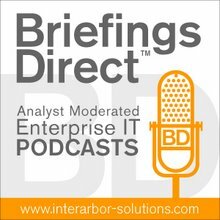 As part of the series of recent news announcements from HP, this discussion examines how such a framework process can unfold, from workshops that allow a frank assessment of an organization’s vulnerabilities, to tailored framework-level approaches that can transform a company based on its own specific needs. Gardner: Why has the security vulnerability issue come to a head? Gardner: What do you think are some of the trends that are supporting this vulnerability? There are two takeaways from this. A structured methodical framework approach helps our customers get the people on the same page, getting the processes from top-down really well-structured so that everyone is aware of how different security processes work and how they benefit the organizations so that they can innovate. [But] it's also about long-term thinking, about building security in from the get-go; this is where companies can start to turn the corner. I'll go back again to web apps, building security into the very requirement and making sure all the way through the architecture design, testing, production, all the way through that you are constantly testing for security. Gardner: What are the high-level building blocks to the framework approach? Then, technologies and services to help them manage that on an ongoing basis, so that you can get more and more of the security controls automated. And then, we help them optimize that, because security just doesn't stand still. So we have tools and services that help our customers keep their eye on the right ball, as all of the new threats evolve or new compliance requirements come down the pike. Gardner: What is HP Secure Boardroom, and why is it an important as part of this organizational shift? ... Because we've been in the systems management and business service management business for so long, I would elevate this up to the level of the business service management. When you think about vulnerabilities, threats, and attacks, the first thing you have to do is have the right visibility. The technology in our security organization that helps us see and find the vulnerabilities really quickly. ... For example, we have a technology that lets you scan software and look for vulnerabilities, both dynamic and static testing. We have ways of finding vulnerabilities in third-party applications. We do that through our research organization which is called DVLabs. DV stands for Digital Vaccine. We pull data in from them every day as to new vulnerabilities and we make that available to the other technologies so we can blend that into the picture. Gardner: Is there a path now toward security as a service, or some sort of a managed service, hybrid model? Lawson: A lot of people think that when the words cloud and security are next to each other, bad things happen, but in fact, that’s not always the case. Gardner: As part of your recent announcements, you're moving more toward a managed services provider role. I'd definitely suggest going to hp.com/go/enterprisesecurity. In particular, there is a report that you can download and read today called the "HP DVLabs’ Cyber Security Risks Report." It’s a report that we generate twice a year and it has got some really startling information in it. And it’s all based on, not theoretical stuff, but things that we see, and we have aggregated data from different parts of the industry, as well as data from our customers that show the rate of attacks and where the vulnerabilities are typically located. It’s a real eye opener. It’s a little startling, when you start to look at some of the facts about the costs associated with application attacks.